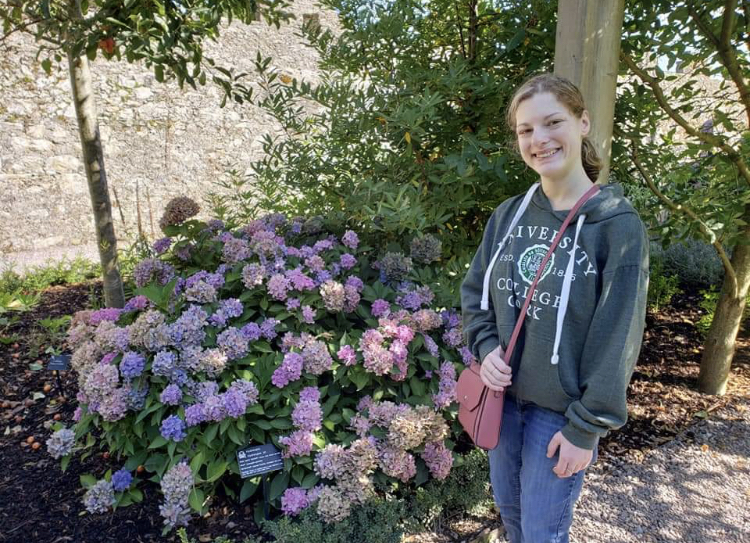 Hailey Hughes in the Blarney Castle Gardens in Co. Cork., Ireland. Hailey Hughes had an “individualized education plan” when she was growing up, a personalized strategy for students with special needs. Together, her parents and teachers would discuss the best ways to meet Hughes’ needs so she could get the most out of her education. Hughes grew up in Parkersburg, West Virginia, and was part of the first surviving set of quadruplets in the state. Like two of her siblings, she has a disability: spastic diplegia, a form of cerebral palsy that affects her gait, fine motor functions, and certain neurological tasks. Her plan meant that in high school, she had extended time on exams and between classes. She could type her assignments, and she had organizational goals, like using a folder system, so she could find assignments. 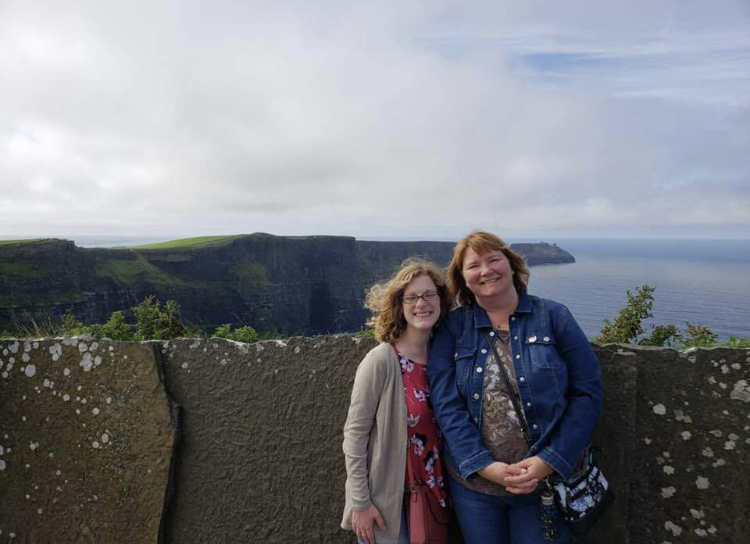 Hughes with her mother, Denise Hughes, at the Cliffs of Moher, Co. Galway. Photo courtesy Hailey Hughes. But Hughes had never been involved with crafting her education plan, so, at the age of 15, she was confused when her history teacher approached her and said she needed to go to her IEP meeting. He was the first person to suggest she participate in planning it. After that, Hughes knew she wanted to work to increase accessibility for people with disabilities and draw attention to blind spots communities might have. She’s taken that goal to Cork, Ireland, where she hosts a writing group to break down social barriers between those with disabilities and those without. “People are just uncomfortable, and I really wanted to parse that out and smooth that over and say people with disabilities have interests and have needs and…in some other way can express them if we allow people with disabilities to have that opportunity,” Hughes said. Aside from her own experiences, her motivation also comes from seeing the ways American culture misconstrues the experiences of people with disabilities in American culture. One of the differences Hughes has noticed between her home state of West Virginia and Ireland is that she frequently sees people with disabilities in public spaces in Cork. She says from an outsider’s perspective, it seems like people with disabilities are more integrated into everyday life. But that doesn’t make talking about disabilities easy. Another difference Hughes says she’s noticed is that, in contrast to West Virginia where people are more willing to articulate their experiences, in Ireland people seem more reluctant to speak about themselves. 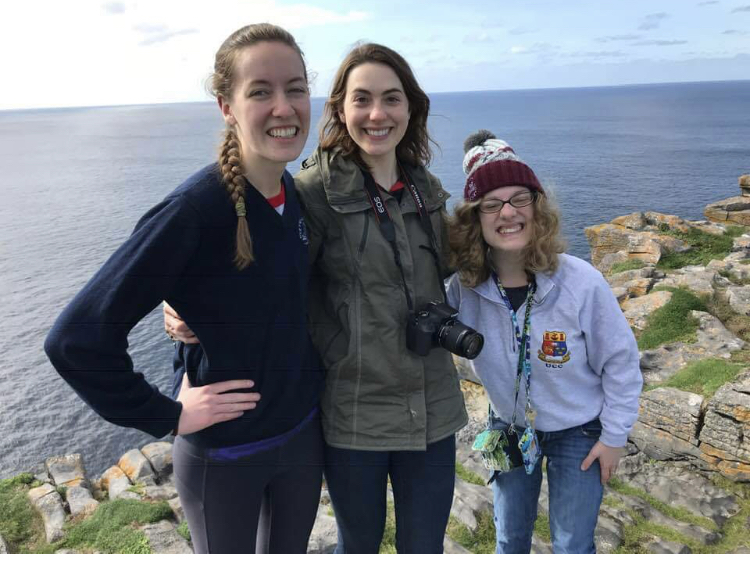 Hughes, Mairéad Willis, and Christine Kannapel on a cliff ledge overlooking the Atlantic Ocean on the Aran Islands. “That has been challenging because if the goal was to talk about experiences with disabilities, then that’s certainly kind of a hurdle,” Hughes said. 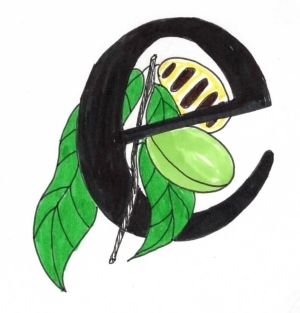 To navigate this challenge, she creates meeting prompts not necessarily directed at a disability, like, “How has someone helped me in the past?” or “How do people see me, and how do I see myself?” Then, she models potential responses, demonstrating that people can choose how much they want to share and what they want to discuss. And the most significant challenge she’s faced—one that likely resonates with many disability advocates in America—is finding an accessible venue. She says, for example, that it’s hard to find a wheelchair-accessible space, has first-floor bathrooms and isn’t cluttered. Hughes says she’d like to do something similar to her current work back in West Virginia, where she’s more integrated into the community and culture. “It’s hard because I love it here, but I feel like I will always feel like the American,” she said. Even among her American friends in Ireland, who come from Oregon and Utah, everyone has their own references; they don’t know the stories behind her Mothman refrigerator magnet, for example. “In that way Ireland is very similar because Ireland culture functions partly on traditional Irish music and storytelling,” Hughes said. 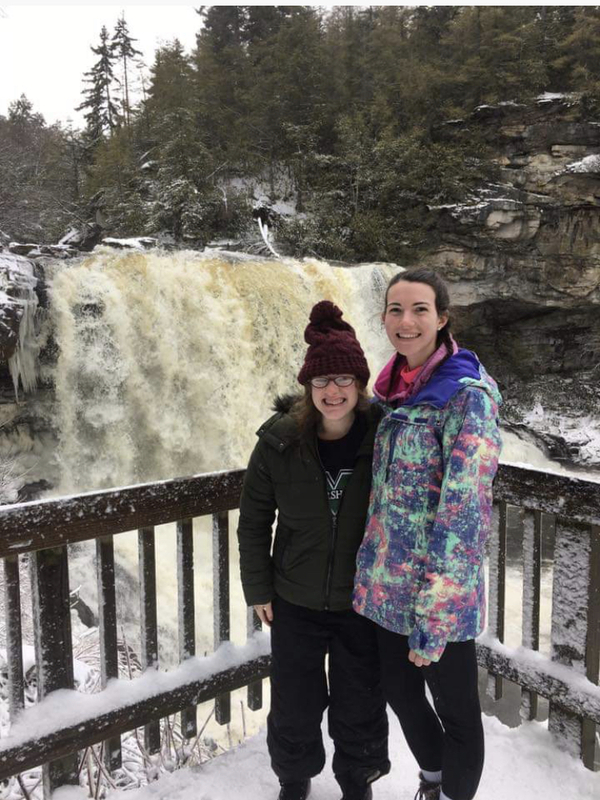 Hughes and her friend, Miriam Smith, at Black Water Falls, West Virginia, after a skiing trip. There’s a lot she misses about her home, like her cats, Kitty and Felix, and sweet tea. But despite her affinity for West Virginia, she’s been away for two years—she originally left in 2017 for graduate school in Georgia—and she’s not sure where life will take her after Ireland. At first, Hughes struggled with her choice to leave West Virginia, but she says now she hopes people know that they don’t need to feel like they are turning their back on their state if they leave.